Lake Bellfield was constructed in the 1960s as a water storage against drought as part of the Wimmera-Mallee Domestic and Stock Supply Water System. The reservoir is at the head of a valley between two mountain ranges giving it a picturesque setting. The stone clad toilet block with cantilevered glass clad viewing platform above with curved roof is an elegant late twentieth century structure associated with the Lake. The Lake is a major recreational facility in the region. Lake Bellfield, Halls Gap is historically and scientifically significant at a LOCAL level. It is associated with the Wimmera-Mallee stock and domestic water supply system which grew to become one of the largest of its kind in the world. Lake Bellfield, Halls Gap is socially significant at a LOCAL level. It is a district recreational destination and is valued and recognised by the local community and regional visitors. Lake Bellfield, Halls Gap is significant at a LOCAL level. Lake Bellfield was created in the 1960s by the construction of a straight dam wall across Fyans creek at the upper end of the valley between the Mount William Range and and the Wonderland Range to form an irregular shaped reservoir which is fed by numerous streams which originate in these ranges. Water is piped by tunnel and underground pipe to the Stawell Water Supply. The lake is also used for local and regional recreation including swimming, fishing, windsurfing, canoeing and picnics. 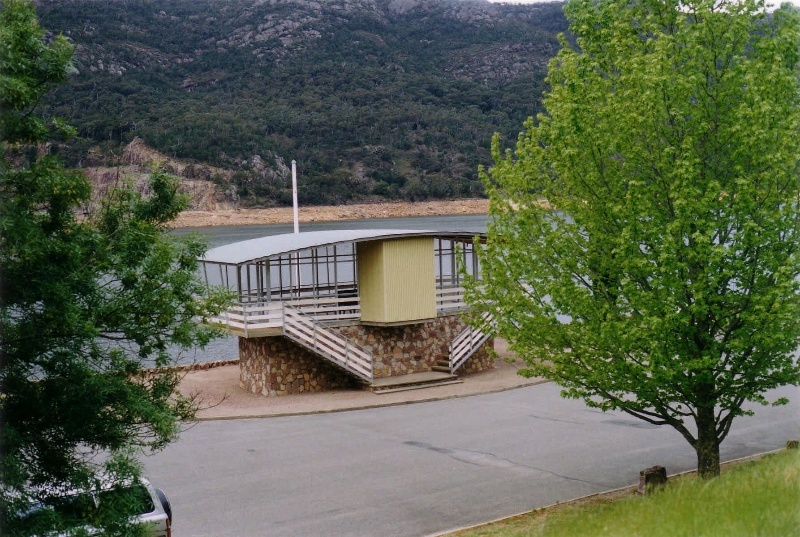 Near the dam wall is the public toilet block and viewing platform. This small, light and elegant structure has the toilet block as the base with stone clad walls. Above this is the steel framed viewing platform which cantilevers over the base on each side. The viewing platform has a central glazed section with small outdoor viewing platforms at each end and on the lake side. These are protected by a thin curved roof structure clad with corrugated metal roof cladding. The underside of the roof is clad in stained timber. A small section of the platform which cantilevers over the back of the structure is clad in vertical timber boards. The viewing platform is reached by flights of open tread stairs to each end. The balustrade of timber horizontal bands gives a strong horizontal element to the design.